16¼ in. (41.5 cm.) high; 14¾ in. (37.7 cm.) diam. A member of the Aldobrandini family, most likely Ippolito Aldobrandini the Elder, later Pope Clement VIII (1536-1605), in the late sixteenth century. Subsequently probably with the Cardinals Cinzio (1551-1610) and Pietro (1571-1621). Ippolito Aldobrandini the Younger (1592-1638), created Cardinal at St. Eustachio in 1621. Recorded in the inventory drawn up after his death in 1638. Giovanni Battista Pamphilij (1648-1709), Duke of Carpineto. with the retail silversmith Kensington Lewis, St. James's Street, London, circa 1826.
with the retail goldsmith Thomas Hamlet (1770-1853), Princes Street, London; sale George Robins, London, 3 February 1834, as by Benvenuto Cellini (1,000 gns. to Emanuel, probably Emanuel Brothers, Bevis Marks, St. Mary Axe, London). Charles Scarisbrick, Scarisbrick Hall, Lancashire; his (+) sale, Christie's, London, 15 May 1861, lot 159, as attributed to Benvenuto Cellini (to Richard Attenborough, of the Strand). Frédéric Spitzer. The Augustus bowl probably combined with the Titus figure at this time; his sale, Paul Chevallier, Paris, 1 June 1893, lot 1761 (see entry under literature). The present Nero figure, combined with the copy of the Titus bowl (see following lot), then in the collection of Johannes Paul, Hamburg; his sale J.M. Herberle, H. Lempertz Söhne, Cologne, 16 October 1882, lot 720, as by Benvenuto Cellini. The present Nero figure, combined with the copy of the Titus bowl (see following lot), in the collection of Heinrich Wencke, Hamburg; his sale, J.M. Herberle, H. Lempertz Söhne, Cologne, 27-28 October 1898, lot 152, as by Benvenuto Cellini. Nella Guardaroba Aldobrandini posta nel Palazzo al Corso habitato dall Em. tima Cardinale D. Benedetto Pamphily. Dodici tazzoni grandi d'argento con piedi alti historiato di baso rilievo con un Imperatore in piedi sopra ciascheduno. Pesano tutti insieme libre cento nove et oncie otto. Rudolph Ackerman's Repository, London, 1826, II, pp. 303-304, as by Benvenuto Cellini. The Times, London, 25 January 1834, p. 8, advertisement, as by Benvenuto Cellini. The Gentleman's Magazine, London, April 1834, p. 418. Sale catalogue, Catalogue des objects d'art et de haute curiosité antiques, du moyen-âge et de la renaissance composant l'importance et précieuse collection Spitzer, Paul Chevallier and Charles Mannheim, Paris, 17 April-16 June 1893, lots 1759-1763 and lot 3025, dated sixteenth century, Augsburg. Catalogue of the exhibition, A Collection of Silversmiths Work of European Origin, Burlington Fine Arts Club, London, 1901, pl. 74, p. 54 (Vespasian). E.A. Jones, Illustrated Catalogue of the J. Pierpont Morgan Collection of Old Plate, London, 1908, pl. 75 (Vespasian). 1913 Bath House Inventory, p. 136, no. 677 (Nero), p. 137, no. 678 (Titus on fluted foot), in the safe. 1914 Wernher Inventory, p. 92, no. 457 (Nero), p. 93, no. 458 (Titus on fluted foot). Sale catalogue, Bertram, 5th Earl of Ashburnham, Christie's, London, 24-26 March 1914, lot 202, as by Benvenuto Cellini (Titus bowl). The Daily Telegraph, London, 27 March 1914, saleroom report by A.C.R. Carter. E.A. Jones, Old Silver of Europe and America from Early Times to the Nineteenth Century, Philadelphia, 1928, pl. 53, p. 212 (Vespasian). Sale catalogue, William Randolph Hearst, St. Donat's Castle, Christie's, London, 16 May 1935, lot 77, as North Italian or South German (Titus Bowl). Catalogue of the exhibition, Coleccão Lázaro de Nova Iorque, Museau Nacional de Arte Antiga, Lisbon, June 1945, no. 110 (Julius Caesar). Y. Hackenbroch, 'The Emperor Tazzas', The Metropolitan Museum of Art Bulletin, no. 7, New York, March 1950, pp. 189-197, dated to circa 1580, Augsburg. Sale catalogue, Anon. 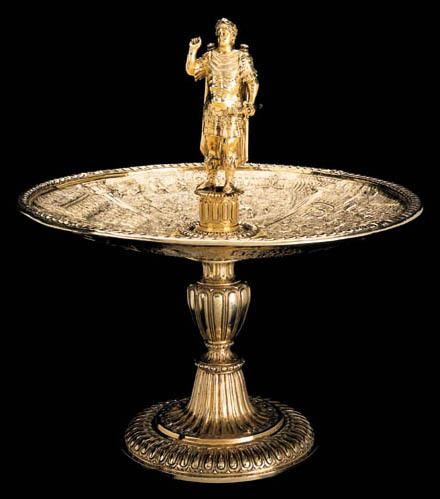 Sale, Christie's, London, 22 June 1960, lot 102, as Augsburg, late 16th Century (Caligula/Galba tazza). J. Camon Aznar, Guia abreviada del Museo Lázaro Galdiano, Madrid, 1962, pp. 96-97. J.F. Hayward, 'The Aldobrandini Tazzas', The Burlington Magazine, vol. 112, no. 811, London, October 1970, pp. 669-674, dated 1560-1570, Italian, chased by an Augsburg trained goldsmith, fig. 18 (Titus on fluted foot). J. Culme, 'Kensington Lewis, a nineteenth-century businessman', The Connoisseur, vol. 190, London, September 1975, pp. 26-41, fig. 5, (Titus on fluted foot). M. Urwick-Smith, Luton Hoo: The Wernher Collection, London, Pitcairn Pictorials, 1975, p. 18. David R. McFadden, 'An Aldobrandini Tazza: A Preliminary Study', The Minneapolis Institute of Arts Bulletin, LXVIII, 1976-77, pp. 42-45, dated 1570-80, Roman, chased by a Northern craftsman. J.F. Hayward, Virtuoso Goldsmiths and the Triumph of Mannerism 1540-1620, London, 1976, pp. 164-165 and 371-376, figs. 363-365. C. Hernmarck, The Art of the European Silversmith 1430-1830, London, 1977, I, pp. 126-127, II, figs. 234-235, dated 1580-1590, Italian or French, chased by a German Goldsmith (fig. 235, Augustus bowl). J. Culme, Nineteenth Century Silver, London, 1977, p. 74. T. Schroder, catalogue of the exhibition, The Schroder Collection, Virtuoso Goldsmiths' Work from the Age of Humanism, Goldsmiths' Hall, London, 1979. Sale catalogue, The Morgan Collection, Christie's, New York, 22 October 1982, lot 68, dated 1570-1585, Italian (Vespasian). T.B. Schroder, The Art of the European Goldsmith: Silver from the Schroder Collection, The American Federation of Arts, New York, 1983, no. 16, pp. 66-71, dated 1550-1560, Italian, chased under supervision of Flemish goldsmith. Catalogue of the exhibition, The Treasure Houses of Britain, Five hundred Years of Private Patronage and Art Collecting, National Gallery of Art, Washington, D.C., 1985, pp. 578-579, no. 515, the present bowl and figure dated 1570-1585, illustrated on Spanish foot, now with the following lot. Y. Hackenbroch, 'Reinhold Vasters, Goldsmith. A Hardstone Statuette', Metropolitan Museum Journal, vol. 20, 1985, pp. 256-258, as possibly by an Augsburg trained goldsmith in Italy (Vitellius). J.M. Cruz Vadovinos, Introducción a la colección de plateria del museo Lázaro Galdiano, Goya, 193-195, Madrid, 1986, 36-38. J. Culme, The Directory of Gold and Silversmiths, 1838-1914, London, 1987, I, p. xxi and 206. P. Glanville, Silver, London, 1996, pp. 55 and 133, dated 1560-1575, possibly Flemish. J.M. Cruz Valdovinos, catalogue of the exhibition, Plateria Europea en España, 1300-1700, Fundación Central Hispano, Madrid, 15 October-14 December 1997, pp. 166-170, dated 1570-1580, Roman. Washington, D.C., National Gallery of Art, The Treasure Houses of Britain, Five Hundred Years of Private Patronage and Art Collecting, exhibited on Spanish foot, now with the following lot. The tazza described above, together with the figure of Titus described in the following lot, once formed part of a magnificent set of twelve tazze, each centred by a figure representing one of the first twelve Caesars of Imperial Rome, starting with Julius Caesar and ending with the Emperor Domitian. The figures are shown standing atop a fluted column that simultaneously serves to divide four scenes that were chased in aerial perspective on the bowl beneath, illustrating the respective Emperor's life. The literary source for these scenes was presumably De vita Caesarum by Gaius Suetonius Tranquillus (c. A.D. 69 - after 122), a Roman biographer and antiquarian. His biographies were written in a concise style, enlivened with gossip and scandals relating to the lives of Julius Caesar and the first eleven Emperors. Since the first modern translation, published in 1470, the perception of Roman antiquity was largely based on this text, illustrating society and its leaders, their habits and appearance, their family background, careers and deaths. Numerous Renaissance engravings, medals and works of art emanating from the goldsmith's workshops drew their inspiration from De vita Caesarum. The history of these twelve emperor tazze is complex and is currently the subject of a research project. Of the literature listed above, the articles by Dr Yvonne Hackenbroch, 1950 and 1985, John F. Hayward, 1970, and David R. McFadden, 1976, have each added greatly to our understanding. A combination of their researches and information gained more recently allows one to sketch the following summary of the history of what was described by John Hayward as "the most impressive single monument of Italian and perhaps European goldsmith's work of the 16th Century." At present, it is not clear who commissioned this important set of tazze, however six of the bowls were pricked, probably in the beginning of the seventeenth century, with the arms of Aldobrandini, each within a scrollwork cartouche, surmounted by a cardinal's hat balancing on a cross and hung with twelve tassels. These armorials are small in size and are inconspicuously placed, mostly on the underside, thus appearing to be later additions to record ownership. The fact that only half the tazze were in this manner designated and, with one exception, represent successively the second half of the Emperors, may lead one to conclude that the set was divided equally between two members of the same family. The only two possible male candidates from the Aldobrandini family are Pietro (1571-1621) and his cousin, Cinzio (1551-1610), both art collectors and both appointed to the cardinal's post in 1593 by their uncle, Ippolito the Elder (1535-1605), Cardinal by 1581 and elected Pope as Clement VIII in 1592. In view of this, it seems likely that Ippolito Aldobrandini the Elder once owned the complete set of twelve tazze, explaining why the set was known as the Aldobrandini tazze since their appearance on the art market in 1826. After the death of Cardinals Cinzio and Pietro it seems probable that all twelve tazze were reunited in the collection of their nephew, Ippolito the Younger Aldobrandini, in whose inventory, drawn up following his death in 1638, they are recorded (see literature). In the absence of a surviving male relative, the combined inheritance passed through Olimpia the Younger Aldobrandini (1623-1682), by her second marriage in 1642, to Camillo Pamphilj (1622-1666) and it is after the death of their son Giovanni Battista, that the complete set of tazze is again recorded in the Guardaroba Aldobrandini in the Palazzo del Corso in 1710 (see literature). In the early nineteenth century, the tazze were in England as, by 1826, the flamboyant London retailer Kensington Lewis was, according to Rudolph Ackerman's Repository, exhibiting "twelve very curious silver ornaments" which were said to be, "by the celebrated Italian artist, Benvenuto Cellini". The Repository went on to speculate, "that they were executed by Cellini about the year 1560, for the celebrated Cardinal Aldobrandini, afterwards Pope Clement VIII, whose arms are introduced on several spaces of the chasing, and passed into the family of Borghese, his successors. They were reckoned till 1792 among the chief ornaments of the Aldobrandini palace, and were then carried off and buried to save them from the rapacity of the French. They afterwards became, in what manner we are not informed, the property of one Dominichi, the steward to the family at that perilous period; at his death they came by purchase into England ... while the money payed is expended in masses and charities for the good of the soul of the last possessor". After Kensington Lewis the tazze were with Thomas Hamlet, another retailing goldsmith who, at a time of considerable financial difficulty, sold them at auction in 1834. The sale, however, of Charles Scarisbrick's plate at Christie's in 1861, when the set was purchased by Richard Attenborough, was to be the last time all twelve pieces were on public view together. It is after this date that the mistaken combinations of figures and bowls took on more serious consequences since the entire set was not sold to the same collector. In addition, shortly after this date, the tazze were gilded. Up until the Scarisbrick sale they had always been described as silver (the sale catalogue included separate sections for both silver and silver-gilt). During this time a copy was made of at least one bowl, the one chased with scenes from the life of Titus. This copy (included in the following lot), combined with the original figure of Nero (included in the lot above), formed part of the Johannes Paul collection, sold in Cologne in 1882. Finally, six of the tazze were given more ornate, Renaissance-style feet, replacing the original ones ornamented with flutes and gadroons. These feet, that Cruz-Valdovinus describes as Castilian, circa 1575, from the Alcala region, differ slightly from one another and it seems most likely that two sixteenth-century feet were adapted to support the tazze and served as models for another four feet. Unfortunately it seems likely that the fluted feet were melted down for this purpose. At the time of the publication by Alfred Darcel of La Collection Spitzer in 1890, six tazze were included bearing this modification, namely the tazze that at that time were surmounted by the figures of Julius Caesar, Otho, Vitellius, Titus, Domitian and Vespasian (this last mentioned was at that time on the Augustus bowl included in this lot). Frédéric Spitzer (1815-1890) was an Austrian art dealer and collector who settled in Paris in 1852. He established a shop in Aachen in 1855 and it is probable that a business relationship was formed with the very gifted goldsmith, Reinhold Vasters (1827-1909), then a restorer at the Cathedral. It seems very likely that much of the alterations to the tazze described above were commissioned by Spitzer. A. C. R. Carter in The Daily Telegraph, reporting the Christie's Ashburnham sale in 1914, where the original Titus bowl without figure and foot was sold, commented on the Scarisbrick sale that: "The purchaser was old Mr Attenborough of the Strand. He sold eleven to Mr. Spitzer for £5,000 apiece, and the theory is that the fourth Earl of Ashburnham bought the remaining one. In due course Spitzer placed five in the princely homes of the Rothschilds at about £59,000 a dish, and we know there is one in the Pierpont Morgan collection". In spite of the vicissitudes of time all twelve silver Emperor tazze have survived and a list of their components and present locations is herewith printed below. When the six tazze in the Spitzer collection were sold in 1893, the purchaser of all was also given lot 3025, catalogued as a manuscript description of the set, 49 pages, dating from the seventeenth century, in a binding measuring 20 by 26 cm., covered in green velvet, embellished with Roman coins and the Aldobrandini arms. It has not yet been possible to identify the purchaser and the manuscript remains to be accounted for. Also mentioned was a work of "great erudition and labour" that described the Caesar's scenes, now lost. While the set was still complete, casts in bronze were made from the twelve Caesar figures and placed on triangular bases in late Renaissance, Italian style. These are now in an English private collection, having been offered for sale in these Rooms, 26 April 1976, lot 131, on behalf of the 6th Earl of Arran's Will Trust. Described as by Benvenuto Cellini, the Emperor tazze were catalogued as probably Augsburg, 16th Century, when in the Spitzer collection. Most recent scholars, however, once again credit Italy with the elegant design. This is supported by considering the work of Pirro Ligorio (1513-1583), an architect, painter, draughtsman and, above all, learned antiquary. Today Ligorio is best known for the casino of Pope Pius IV in the gardens of the Vatican and the design for the gardens for the Villa D'Este at Tivoli. Soon after entering the service of Cardinal Ippolito II D'Este of Ferrara in 1549 as court archaeologist, Ligorio was mentioned in the records of the Vatican as overseer of the fountain in the square. In 1555 he entered papal service when a fellow Neapolitan was elected as Pope Paul IV and soon was appointed architect of the Vatican palace, finally succeeding Michelangelo in August 1564 as the architect of St. Peter's. It is noted with interest, that before entering the service of Alfonso II D'Este, Duke of Ferrara in 1568, Ligorio sold his collection of ancient medals and his first voluminous manuscript encyclopedia of classical antiquities, the Libri dell'antichit' di Roma (Naples, National Library), to Cardinal Alessandro Farnese, of the family for whom he is known to have executed designs. This introduces the very real possibility that the original commission of the tazze was from a Farnese. At the end of the century, they may well have been given to Ippolito Aldobrandini, Pope Clement VIII. As first noted by Dr. Michael Stoughton of the University of Minnesota (McFadden, 1976, op. cit, note 21), the composition of the chariot race in the Circus Flamini on the Caligula bowl (The Minneapolis Institute of Art) faithfully reproduces a print by Nicolas Beatrizet after a drawing of The Circus Flaminius by Pirro Ligorio (Bartsch XV, p. 271, no. 104). The composition of the harbour and lighthouse at Ostia on the Claudius bowl is also a precise rendering of an engraving by Giulio de Musi, after Pirro Ligorio. The figures of the twelve Caesars may well have been based on the engraved Caesars on horseback by the Bruges-born artist, Johannes Stradanus (1523-1605), who was active and died in Italy during the second half of the sixteenth century (McFadden, 1976, loc. cit.). The accomplished goldsmith who was responsible for the chasing of the tazze was most probably someone who was trained in the South German cities of Nuremberg or Augsburg, as has been noted by most recent scholars. This may account for the numerous South German Renaissance buildings shown in various scenes, the somewhat non-classical architectural order of the columns, the distinctly South German landscapes shown on the edges of some scenes and, maybe, the inclusion of the Augsburg pine cone on a banner on the Domitian bowl, as noted by Hackenbroch. (The purchasers of this and the successive lot are kindly requested to consider lending these tazze to an exhibition planned to reunite all twelve tazze. For further information on this project, please contact the Silver Department at Christie's).